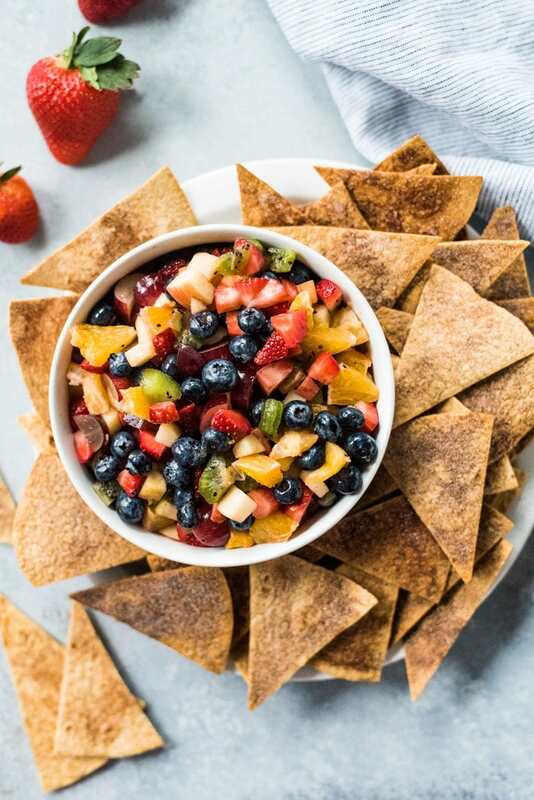 This Fruit Salsa with Cinnamon Chips recipe is made with 6 different types of fruit and is served with baked cinnamon sugar tortilla chips for a fun appetizer or healthy dessert! 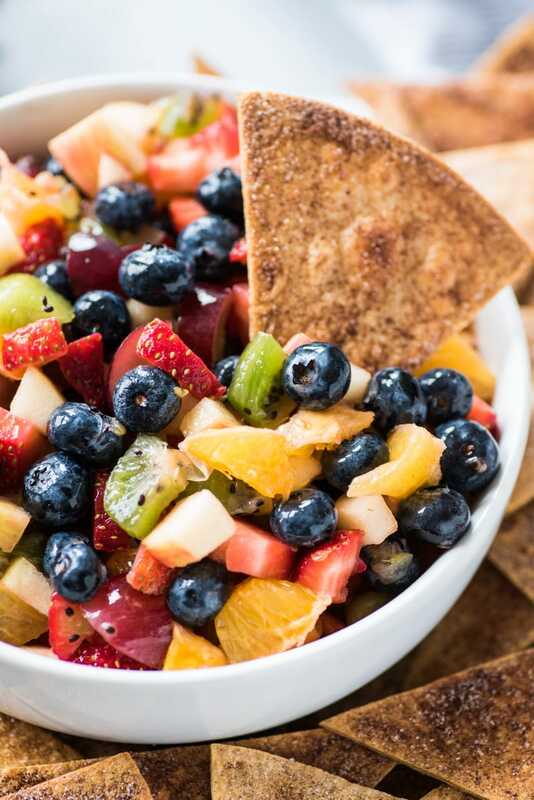 There’s nothing like a big bowl of fresh fruit salsa served with cinnamon chips to make me miss the warm summer days. Notice how they’re all…cloudy. I’m starting to think that there’s definitely something to those light therapy lamps used to treat Seasonal Affective Disorder. If only I lived in Miami or Cancun or Santa Monica. I’d be so warm and tan! But since I don’t, the next best thing is to bring some warm sunny vibes into my life through food. Meaning all the fruit! This fruit salsa contains a total of six different types of fruit – seven if you count the fresh lemon juice. I chose some of my favorites like blueberries, kiwis and apples, but it’s very customizable and can be made with whatever fruit you have. To take it to the next level and make it party and dessert worthy, I served it along with some crunchy cinnamon chips. I was first introduced to these chips by my best friend. She brought it over as an appetizer once when John and I were throwing a party. I thought it was such a great healthier appetizer idea! I owe this recipe to her. To make, all you need is some cinnamon, sugar, nonstick cooking spray and soft-taco size flour tortillas. For the cooking spray, I actually use a refillable oil sprayer that I use with my own olive oil. It’s super affordable and saves me money in the long run because I don’t have to keep buying those cans in the store. The one I have is The Misto, but I’ve also heard great things about the Evo. 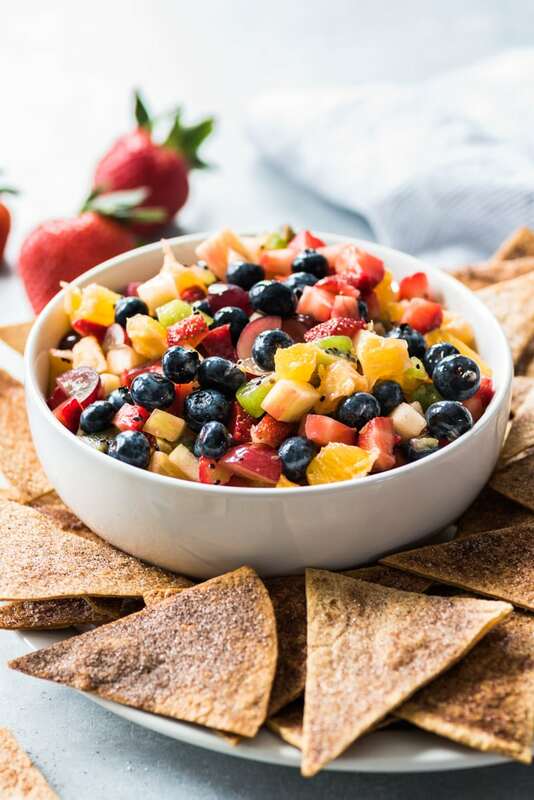 Whether served as a fun party appetizer or a healthy dessert, this fruit salsa will not disappoint! How long does fruit salsa last? 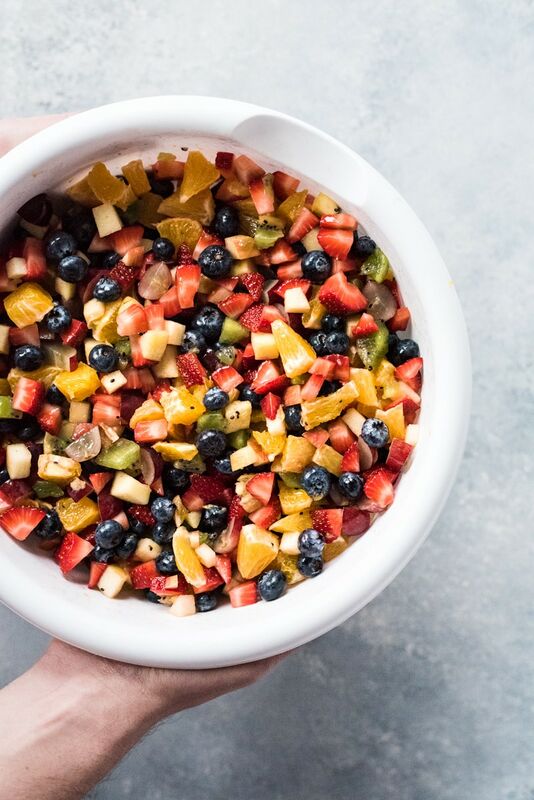 Fruit salsa lasts about one week in the fridge. After that, the fruit starts to get mushy and watery. Kinda. You can freeze it, but once it’s thawed, the texture just won’t be the same. However, since the salsa is literally made up of only fruit, it’s perfect for throwing in your morning smoothies, oatmeal or yogurt! How long do cinnamon chips last? Cinnamon chips last about two weeks in a zip lock bag in the pantry. In a large bowl, add all the ingredients. Toss together to combine and serve immediately or cover and chill in the fridge until ready to eat. Preheat oven to 350°F. Spray two large baking sheets with cooking spray. In a small bowl, add sugar and cinnamon. Mix together until fully combined. Cut flour tortillas into 8 triangles each (like you would cut a pizza) for a total of 80 triangles. Place the tortilla triangles onto the prepared baking sheets in one single layer, making sure they don't overlap with any others. You may have to bake them in two or three batches, depending on the size of your baking sheets. Spray the tortillas with cooking spray and sprinkle with cinnamon sugar. Flip them over and do this again on the other side. Bake for 15 minutes, until golden brown and crispy.